New York, NY – December 10, 2018 Kali, Inc. (USOTC: KALY) is rated VERY BULLISH today by Stockta.com after the company announced a $300,000 contract to extract hemp-derived CBD. The PPS is up over 30% and KALY trading volume is in the top 50 most actively traded stocks on OTCMarkets. Learn more about NCM Biotech at www.kali-extracts.com. Other cannabis companies in the top 50 most actively traded on the OTCMarkets today include North American Cannabis Holdings, Inc. (USMJ), HEMP, In.c (HEMP), and Enviro-Serv (EVSV). New York, NY – November 16, 2018 Kali, Inc. (USOTC: KALY) is recommended as a “BUY” today by AmericBulls.com following yesterday’s announcement that KALY had finalized the acquisition of NCM Biotech, the developer and owner of a patented cannabis extraction process - U.S. Patent No. 9,199,960 entitled “METHOD AND APPARATUS FOR PROCESSING HERBACEOUS PLANT MATERIALS INCLUDING THE CANNABIS PLANT.” The KALY news reported the company plans to leverage the patent to enter the cannabis pharmaceuticals and concentrates market. The news yesterday further reported that the cannabis pharmaceuticals market is forecasted to reach $50 billion in sales by 2029, and that the cannabis concentrates for wellness, edibles and recreational markets is forecasted to reach $8.5 billion in annual sales by 2022. Notably, the news yesterday emphasized that KALY had no plans for a reverse split in conjunction with the patented cannabis extraction acquisition. New York, NY – October 30, 2018 – Enviro-Serv Inc. (USOTC: EVSV) continues with a VERY BULLISH rating based on candle stick analysis after the company announced plans to enter the cannabis sector as as service provider to hemp farmers. The company has hinted at a pending strategic announcement with a recognized cannabis sector company coming soon. Being headquartered in Florida, the midterm election results today could have a positive impact on the company’s cannabis sector plans with more pro legal marijuana elected officials coming into office. “The stock price direction for the day for EVSV is UP. The stock is experiencing a strong uptrend as of late … Based on BullishInvestor.com’s proprietary algorithms, EVSV is currently signaling VERY BULLISH. NextBigTicker.com has also recently featured West Coast Venture Group, Corp (WCVC), Puration, Inc. (PURA) and Optec International (OPTI). New York, NY – November 6, 2018 - LandStar, Inc. (OTCPK: LDSR), the parent company of Data443™ Risk Mitigation, Inc. (“Data443”), a leading data security and privacy company, is featured in a release from BIGToken, a consumer Blockchain platform. The BIGToken feature was released yesterday addressing the burgeoning Data Privacy market. The feature includes quotes from Facebook (NASDAQ: FB) CEO Mark Zuckerberg, Microsoft (NASDAQ: MSFT) CEO Satya Nadella, Jason Remillard, CEO and founder of LDSR’s Data443. The article is included below, in addition to a link to the original article. The article has been republished here to emphasize the as of yet undiscovered LDSR opportunity. LDSR closed yesterday at $0.005 at the same time it was featured in an article with Microsoft and Facebook. Recent analyst coverage recommended LDSR at a Speculative BUY with a $0.027 Target PPS. With LDSR being featured by the Data Privacy industry side by side with Micrsoft and Facebook, it appears that LDSR is undervalued and that even the over 400% ROI that would be realized at the $0.027 Target PPS, might not adequately represent LDSR’s underlying value. BIGtoken Team -The blockchain platform for consumers to own, verify, and sell their data. In this week’s data privacy news, the CEO of Microsoft urges tech companies to focus on data privacy, Mark Zuckerberg announces Facebook’s data privacy timeline, Data443 releases an innovative data security product, and more. In a keynote address this past Thursday, Nadella voiced his support for privacy as a “human right.” He focused on three major elements: privacy, cybersecurity and AI ethics. He cited EU’s General Data Protection Regulation (GDPR) as a model form of legislation. This nod follows a similar sentiment from Apple CEO Tim Cook, who championed the legislation at a talk this month as well. Nadella urged companies to see common citizens and small businesses as the most vulnerable to cyber threats, and tasked them with using their power to protect them. “We need to use our collective prowess and power to protect these most vulnerable of populations, and it requires not just our industry but also nation states to be part of that,” he said. His final note touched on the importance of regulating AI as the impressive technology continues to develop. The need for ethical standards around artificial intelligence is becoming dire, and it’s the responsibility of massive tech companies like Microsoft and Apple to reckon with the consequences of this innovation. In a third-quarter earnings call with analysts, Facebook CEO Mark Zuckerberg reportedly claimed that some much-needed privacy updates are coming in 2019. “A few years ago, Facebook was very behind where it needed to be,” Zuckerberg said. “We started a three-year roadmap through the end of 2019 to get our systems to the level where we think we should be at — systems that can flag information that we think might be problematic to a much larger security and review team.” He went on: “But we are up against sophisticated adversaries and threats will continue to evolve.” He reassured them by saying that the company is getting better and better at detecting threats and eliminating them. More specifically, Zuckerberg claimed that the platform has flagged several groups from Russia and Iran who have been using social media to sway elections and encourage political and social divisions in the U.S., the UK and elsewhere. But he cited the massive growth of Facebook users as the key issue moving forward. Facebook had 2.27 billion monthly average users in September. It’s estimated that more than 2.6 billion people now use Facebook, WhatsApp, Instagram, or Messenger each month. Companies are expected to spend $124 billion worldwide on information security products and services in 2019, and a large portion of that spending is to ensure GDPR compliance. And as cloud services become more and more popular, that market increases to an estimated $300 billion-plus by 2021. The adoption of cloud services is the way of the future, but it increases the need for sophisticated security. The newest version of ClassiDocs is certainly one of the most comprehensive solutions to the problem yet. NextBigTicker.com has also recently featured Puration, Inc. (PURA), North American Cannabis Holdings, Inc. (USMJ) and Alternet Systems, Inc. (ALYI). Almost overnight, Generex Biotechnology (OTC – GNBT) could go from also-ran to a firm generating revenue at an annual run-rate of hundreds of millions annually. The Company just closed on an acquisition that has generated $100M or more annually in recent years and is primed to grow dramatically as it begins to offer its services in 30 states, versus 3 this year. There are more deals in the pipeline. Generex plans to become a diversified health care firm that utilizes cash from its high growth M&A targets to help fund its R&D in the areas where an unmet need exists. These include diabetes, breast cancer, prostate cancer and others. The Company is collaborating with a Canopy Growth-invested firm to explore using one of its delivery system offerings for medical marijuana patients in Canada. Generex announced a 20:1 stock dividend with a record date of Friday (which means investors must own the stock by Tuesday or Wednesday to be eligible to receive it). While there is likely to be a re-adjustment in share price as a result, the current market capitalization, compared with its likely revenue next year (via M&A) and underlying value of its portfolio, appears to be at a major discount. New York, NY – November 5, 2018 – OPTEC International, Inc. (OTCQB) is, so far, a quiet little green energy firm producing an emissions reducing device built on a proven patented technology. The company is likely to become a recognized brand name in the near future. OPTEC entered the market this past summer when it acquired rights to the emission reducing technology for the international market. The OPTEC technology is packaged into a device that can be fitted onto a gasoline or diesel engine to improve fuel efficiency and reduce emissions. Savings from reduced fuel consumption makes emissions reduction actually cost effective. The OPTEC Fuel Maximizer works on personal transportation and is ideal for truck fleets. The global automotive aftermarket sector size in 2016 was over $640 billion and is expected to reach over $722 billion by 2020. The technology is also applicable to generators producing electricity opening another entire market opportunity for OPTEC’s green energy solution. Green energy solutions that reduce harmful carbon emissions from existing petroleum powerplants is an underappreciated, but essential market segment. The transition to electric powered transportation or other alternative fuel solutions is years away and in the meantime, carbon emissions reduction relies on improving the efficiency of existing petroleum fuel burning powerplants. OPTEC is a standout in this underappreciated market that will soon come to the market’s attention as endeavors like Tesla (NADAQ: TSLA) continue to run into roadblocks and setbacks. At $5.00 PPS with a 52-week high of $10.40 and only 3.2 million shares in the float, OPTEC presents an attractive opportunity for a quick double as the company’s practical green energy solution gains market awareness. The product is a small, non-intrusive system that connects to an engines fuse box and source of vacuum. It requires no tanks or water reservoirs. By definition the Optimized Fuel Maximizer is a hydrogen fuel cell and it’s function is to emit a micro amount of hydrogen and cooler air into the combustion chamber to complete the combustion of the fuel. The technology is fully patented by the manufacturer and has undergone rigorous third-party testing to support performance claims and engine safety. New York, NY – October 31, 2018 – Generex Biotechnology Corp (OTCQB: GNBT) stock has been rated a BUY based on candle stick analysis. The rating comes after the company announced a 20:1 for one dividend record date of Monday, November 5th, 2018 with a rapid payment date the next week on November 13th. Generex became a prominent new player in the cannabis pharmaceutical sector recently when the company announced a deal with HydRx Farms Ltd. which is more commonly known by its operating name, Scientus Pharma. Scientus is backed by Canopy Growth (NYSE: CGC). The BUY rating was issued before the Generex BREAKING NEWS just published this morning on the company’s acquisition of the remaining assets Vento Holding. “Our system’s recommendation today is to BUY. The BULLISH ONE WHITE SOLDIER pattern finally received a confirmation because the prices crossed above the confirmation level which was at 9.9500, and our valid average buying price stands now at 10.0150. New York, NY – October 31, 2018 – Generex Biotechnology Corp (OTCQB: GNBT) today announced a deal with HydRx Farms Ltd. which is more commonly known by its operating name, Scientus Pharma. Scientus is backed by none other than Canopy Growth (NYSE: CGC). Check out the bottom of page 5 of Canopy Growth’s Management Discussion & Analysis found on Canopy’s website to see their 9.9% HydRx ownership. Generex, by itself is no slouch. Generex, separate from Scientus and Canopy, has just filed an investigational new drug application (IND) with the U.S. Food & Drug Administration (FDA) to initiate Phase II Clinical Trials of a vaccine for patients with breast cancer. The Generex breast cancer vaccine was develop in conjunction with research conducted with Merck (NYSE: MRK). Together Scientus and Generex plan to deliver Scientus’s proprietary THC and CBD extractions via Generex’s RapdMist buccal mucosa delivery technology. In other words, a medicinal THC and CBD delivered a spray in your mouth. Generex is currently a quiet giant of a pharmaceutical company that most people probably are not yet aware even exists. Do a little research and you will find Generex is loaded with proprietary, intellectual property protected pharmaceutical technology. Given its recent FDA trials announcement and today’s partnership with Scientus, Generex is likely ready to no longer be quiet about its giant-hood. Do a little more research and you will find the Generex has a pending 20:1 dividend coming soon. With just over one million shares currently issued and out, the dividend will take the issued and out just over 21 million with the holders of the roughly one million shares each getting 20 more shares for every share they own on the ex-dividend date. And no, the ex-dividend date has not yet been set, but looks to be coming soon. At a $10 million market capitalization, given the market capitalization of GW Pharmaceuticals (GWPH) at $4 billion, not to mention the $100 million market capitalization of delinquent filer Cannabis Science (OTC: CBIS), GNBT seems extraordinarily undervalued. With GNBT’s IP portfolio, the current less than $10 PPS deserves to at least hold post the 20:1 dividend giving an investment now a potential 2000% ROI. Even if the PPS were to remain at its currentl level, that will still just be a $200 million market capitalization. The GNBT market cap likely has potential beyond $200 million giving a $10 per share investment now even a more dramatic upside opportunity. New York, NY – October 29, 2018 - Puration, Inc. (PURA) closed trading on Friday above $0.12 after two days of buy-side trading volume. AmericanBulls.com has issued a BUY rating based on candle stick analysis. The stock has traded approximately $100 million is the last 30 days. On September 16th, the PPS was $0.03 and on October 16th, the PPS reached a high of $0.25. After the PPS hit the $0.025 Target PPS previously issued by Goldman Small Cap Research, Goldman subsequently issued a TRADE ALERT indicating the pull-back was a buying opportunity and that the PPS was anticipated to return to its previous $0.25 target PPS. “Our system’s recommendation today is to BUY. The BULLISH HARAMI pattern finally received a confirmation because the prices crossed above the confirmation level which was at 0.1180, and our valid average buying price stands now at 0.1182. “One of the most explosive plays in the cannabis-related space that remains well above its September levels is Puration Inc (OTCMKTS:PURA). The stock is a player in the cannabis-infused beverage space that recently disclosed some talks with major beverage companies, including a player in the Coca-Cola corporate food chain. That theme has further developed, and now the company just announced that its EVERx CBD Sports Water will be available for purchase online soon. Top marijuana stocks to watch now – Tilray (TLRY), Canopy Growth (CGC) and Aurora Cannabis (ACB). Learn more about Puration’s stock performance potential at Goldman Small Cap Research, and learn more about Puration’s overall business on the company’s website. New York, NY – October 26, 2018 – The cannabis sector is a red-hot sector on the heels of the first G-7 nation, Canada, implementing its legal recreational marijuana laws last week and with the United States on the verge of taking hemp off the DEA schedule 1 list in the pending passage of the 2018 Farm Bill. Triple zero priced stocks ($0.0001 - $0.0009) can rapidly deliver a high rate of return on investment when a company priced in this range closes on a business development initiative showing the slightest prospect that the company might just edge a little closer toward long-term success. Combine triple zero priced stocks with red-hot cannabis sector opportunities and you increase the likelihood that a $0.0001 PPS could go to $0.01 delivery a 2000% ROI. Here are some promising cannabis sector companies with triple zero priced stocks that have appealing cannabis business plans and the prospects to be 1000% ROI opportunities. Kali, Inc. (USOTC: KALY) ($0.0008) – KALY just announced an LOI to acquire a patented cannabis extraction business. The stock price jumped on high volume from $0.0002 to $0.002 and then retraced back to its current $0.0008 level now. If KALY caries through and closes the patented cannabis extraction acquisition, its quite possible the PPS could go above a penny on short notice. Enviro-Serv, Inc. (USOTC: EVSV) ($0.0002) – EVSV has an interesting background actually making money in pest control and fertilizer. Well management saw the legalization of hemp farming on the 2018 farm bill and wisely decided to get into the market. It’s only a matter of time before EVSV announces there first hemp farming contract likely igniting a rapid PPS climb into the double zero range delivering a 1000% ROI. Nouveau Life Pharmaceuticals (USOTC: NOUV) ($0.0002) - NOUV has recently acquired a cannabis cultivation operation from cannabis industry juggernaut Puration, Inc. (USOTC: PURA). The company is issuing a stock dividend to the shareholders of PURA. The dividend, set to be declared on the 15th of November, and the overall business relationship with PURA stands to potentially drive NOUV into the double digits between now and the 15th of November. North American Cannabis Holdings (USOTC: USMJ) ($0.0003) – USMJ is a sub penny institution in the cannabis sector. The company has incubated and produced multiple cannabis industry enterprises. USMJ, in fact, spun off the operation that is now PURA and USMJ is getting ready to spin-off another operation – the AmeriCanna Cafe which has already announced a contract with a Denver Restaurant chain [a subsidiary of West Coast Venture (OTCQB: WCVC)] to bring the cannabis themed restaurant to Colorado. USMJ has delivered multiple $0.0001 runs to $0.001 in its long cannabis sector history and is likely deliver another one in conjunction with the latest spin-off and dividend. Management has shown no interest in reverse splits and seems content with working in the sub penny range continuing to incubate new cannabis sector enterprises and giving shareholders the opportunity to enjoy one triple zero to double zero run after another. 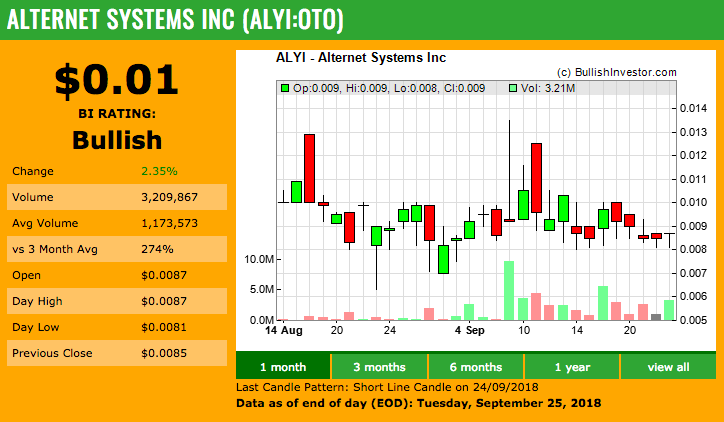 New York, NY – October 26, 2018 – Alternet Systems, Inc. (USOTC: ALYI) is rated a BUY today by AmericanBulls.com. The BUY rating followings the market response to Alternet’s recent move into hemp energy kicked off by the engagement of Clarkson University Professor David Mitlin, a leading expert in electrochemistry and a pioneer in the use of hemp as a clean, renewable energy in the form of a supercapacitor. Alternet announced yesterday David Mitlin being featured in a recent Forbes publication on the industrial applications of Hemp titled The Age Of Hemp: Global Advanced Industrial Applications. “Our system’s recommendation today is to BUY. The BULLISH PIERCING LINE pattern finally received a confirmation because the prices crossed above the confirmation level which was at 0.0080, and our valid average buying price stands now at 0.0081. Other cannabis sector companies in the news include Puation, Inc. (PURA), Rocky Mount High Brands, Inc. (RMHB), and North American Cannabis Holdings, Inc. (USMJ). New York, NY – October 24, 2018 – Enviro-Serv Inc. (USOTC: EVSV) breakout yesterday after reporting developments in the $10.6 billion hemp farming sector in light of the anticipated nationwide legalization of hemp farming contemplated as part of the 2018 Farm Bill. Trading volume and PPS jumped with 65 million shares of buying closing at a PPS of $0.0003. Stock Tech Analysis (stockta.com) has rated EVSV as VERY BULLISH based on candlestick analysis. EVSV’s entry into the red hot cannabis sector could see momentum carry the PPS in the double zero range delivering a near-term 300% ROI. Other hot cannabis sector stocks include Pot Networks (POTN), North American Cannabis Holdings (USMJ) and Nouveau Life Pharmaceuticals (NOUV). New York, NY – October 18, 2018 Kali, Inc. (USOTC: KALY) trading reached record high volume on Friday with over 600 million shares traded. The price per share (PPS) jumped up 100% to close at $0.0006. With a 52-week high of $0.0021, the PPS could still climb over another 300% back to its 52 week high now that the company has entered the red hot cannabis sector. Kali, Inc. (USOTC: KALY) announced a letter of intent (LOI) on Friday, October 19th, 2018 to acquire NCM Biotech. The Friday press release reported that NCM Biotech has developed a patented cannabis extraction process - U.S. Patent No. 9,199,960 entitled “METHOD AND APPARATUS FOR PROCESSING HERBACEOUS PLANT MATERIALS INCLUDING THE CANNABIS PLANT.” NCM’s process has been engaged in a number of medical and pharmaceutical research and development projects in addition to being licensed to Puration, Inc. (USOTC: PURA) for commercial applications. “I have received doctor feedback from more than one of our research initiatives that extracts coming from NCM Biotech’s patented process are superior in purity and quality to any other available cannabis extracts,” said Frederick Ferri, CEO and Founder of NCM Biotech. “Some feedback has specifically indicated that a number of our candidate pharmaceutical products under development have a greater efficacy potential than GW Pharmaceutical [GWPRF] products and candidate products. The acquisition plans contemplate NCM management assuming the senior management positions at Kali in conjunction with the planned acquisition. Kali plans to pursue pharmaceutical and other commercial applications of its patented extraction process building on the success of its current research projects and its success with Puration. Kali maintains assets and operations today in the marina management business of which it plans to divest in conjunction with the planned acquisition of NCM Biotech. In addition to reporting 600% growth, a spinoff and corresponding upcoming dividend, the company’s EVERx CBD Sports Water has attracted the interest of Coca-Cola. Other active Companies from around the market with current developments this week include: Cronos Group Inc. (NASDAQ:CRON) (TSX:CRON), Medical Marijuana Inc. (OTC:MJNA), PotNetwork Holdings Inc. (OTC:POTN), MedMen Enterprises Inc. (OTC:MMNFF) (CSE:MMEN). New York, NY – October 1, 2018 - Puration, Inc. (PURA) saw its PPS increase over 50% on Friday trading over $3 million in trading volume. The jump in price and volume was triggered by the DEA select reclassification of CBD and the overall cannabis market interest in cannabis infused beverages. PURA’s EVERx CBD Infused Sports Water has been on the market for well over a year and reported a 600% increase in sales. PURA’s PPS performance bested India Globalization Capital, Inc. (NYSE: IGC) and New Age Beverage Corp (NASDAQ: NBEV) which realized 27% and 32 % gain respectively. Only PURA has a beverage on the market. IGC and NBEV have products “coming soon.” PURA’s first to market and PPS performance are overlooked by the financial industry media being an OTC stock, but clearly PURA is worth keeping an eye on. IGC and NBEV were both featured for their Friday performance by Barron’s. PURA is probably being eyed by companies like IGC and NBEV as a potential acquisition target if not being approached by beverage industry brand names. PURA is a spinoff of another cannabis sector top performer, North American Cannabis Holdings, Inc. (USOTC: USMJ), another stock worth watching. Learn more at www.growusmj.com. New York, NY – Sep 26, 2018 – Alternet Systems, Inc. (USOTC: ALYI) last year entered the alternative energy storage market dominated today by lithium battery technology. They’re business model has evolved over the last year into concentrating on commercial applications of alternative energy storage. The company recently introduced its ReVolt Electric Motorbike’s subsidiary and has since announced their first two orders for their first electric motorcycle currently in pilot production. The market reception to ALYI’s ReVolt strategy has been tepid – not bad, but not great. Well the announcement yesterday by leading electric scooter producer Niu Technology of its $150 Million IPO could in turn heat up the market’s reaction to ALYI’s ReVolt strategy. The details of Niu’s announcement indicate ALYI’s evolutionary business model may have evolved into just the right strategy. Curent candlestick analysis presented by bullishinvestor.com today are signaling bullish. ALYI has recently. ALYI was recently rated a Speculative “Buy” with a target price of $0.09 in a research report published by Goldman Small Cap Research. The technical signals for Enviro-Serv, Inc. (EVSV), Directview Holdings, Inc. (DIRV) and Realbiz Media Group, Inc. (RBIZ) all indicate these companies are on the verge of potential breakouts. EVSV has recently introduced a business expansion that has been received well by the market. This triple zero priced stock is showing signs of heading to double zero and delivering a 1000% ROI. DIRV’s CEO has recently been interviewed by NASDAQ hinting that the company might be heading for an up listing. RBIZ has been reorganizing and repositioning. Combined with positive recent financial reports, the market is responding positively to RBIZ’s new direction. New York, NY – Sep 26, 2018 - Puration, Inc. (PURA) is rated today as BULLISH by Bullishinvestor.com. The PPS is on the rise on healthy volume breaking through the 50-day moving average and testing the 200-day moving average now. The company has reported a 600% increase in sales and just announced introducing its EVERx CBD infused beverage in California. The company has also announced a deal with Nouveau Life Pharmaceuticals, Inc. (NOUV), where NOUV takes over PURA’s cannabis cultivation business and PURA shareholders get one share of NOUV for every five shares they own of PURA. PURA then doubles down on its cannabis beverage business. The PURA PPS has seen $0.09 in recent history and could return there if not blow by the previous high. The October 17th effective date for recreational marijuana in Canada could give PURA a boost too, not to mention the potential benefit to the PURA PPS that could come from the September 30th Farm Bill vote taking hemp off schedule 1. NOUV has seen a major jump in trading volume making itself a regular on the OTC Markets Most Active Trader List. The NOUV momentum coming from the PURA deal could rocket this triple zero into the double zero range delivering a tidy ROI to shareholders. Alkame Holdings, Inc. (ALKM) has coincidently seen increased trading activity to include an increase PPS since PURA’s increase sales announcement. ALKM is PURA’s co-packer for the EVERx drink. Increased sales for PURA means increased sales for ALKM. HEMP, Inc. (HEMP) is one of the few hemp processing companies in the United States. If the Farm Bill goes into law including the removal of hemp from schedule 1, HEMP could see a major boost in PPS.